Another winner from Sonalksis. It may look basic, but if you want a great-sounding filter, TBK fits the bill. Simple interface and control set. 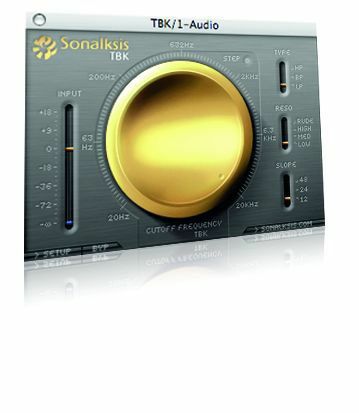 We've loved every single one of Sonalksis´ previous plug-ins and regularly use all of them, so it was with some anticipation that we loaded up TBK. The controls are pretty simple. You set your input level and then your cutoff frequency. This latter control is based on either frequency or (very unusually) on a stepped system spanning notes E1 to D9. Next, you can select the filter type (high-, low- or band-pass) and then move on to the interesting resonance section. Rather than offering a smooth control, this is graded into four settings that include LOW, MED, HIGH and - amusingly - RUDE! Finally, there´s the filter slope, which goes from a traditional 12 to a precise 24, before ending on a scarily surgical 48! We must admit to being a little underwhelmed when we first saw TBK´s simple interface and control set (its size and look just don´t seem as distinguished as its siblings), but such reservations were swept quickly aside. It just sounds gorgeous. Even at extreme settings TBK holds its character perfectly, sounding intense but always musically so. And like all the Sonalksis plugs, this character is as distinctive and recognisable as that of any high-end hardware. If we have one complaint, it has to be the price, but Sonalksis have promised to add a further two plug-ins to the TBK series, and apparently, all three will be available as a discounted bundle.